These chicken breasts stay juicy and tender on the grill because they are first brined in salt water. The chicken is then marinated in lime juice and seasoned with cumin, salt, and pepper. Give this chicken time to brine and marinate and you will be rewarded with lots of flavor and tender, juicy grilled chicken. Another trick for successfully grilling chicken breasts is to slice them in half horizontally and flatten them a bit before grilling them so that they cook more evenly (and more quickly). It's easier to tell when they are done (and to prevent overcooking) when the chicken pieces are all the same thickness. Lime and cumin are a natural seasoning combination, and with a generous amount of salt and pepper, the chicken is delicious on its own. But it would be great served with some kind of spicy salsa like Chilean pebre or Bolivian llajua, or sliced and served with tortillas and other accouterments like guacamole, sour cream, and cheese. Slice each chicken breast in half horizontally to make two pieces of even thickness. If one end of the chicken is thicker than the other end, use the flat side of a mallet to pound the chicken into an even thickness. Place all of the chicken into a bowl. Add 3-4 tablespoons of salt and cover chicken with water. Let chicken brine in the refrigerator for 4 hours or overnight. Remove chicken from brine, rinse, and pat dry. Place chicken in a ziplock bag. Juice the limes and add the lime juice and the olive oil to the bag. Let the chicken marinate in the lime juice, refrigerated, for another 2 to 6 hours. Mix the kosher salt, cumin and ground pepper together in a small bowl. Remove the chicken from the lime juice marinade and place in a dish or on a plate. Rub the chicken on all sides with the cumin/salt mixture. Heat the grill. When the grill is hot, cook the chicken breasts for about 3-5 minutes per side, or until they are browned and just cooked through (cut into the chicken to test for doneness - the juices should run clear and the meat should be firm and opaque all the way through). 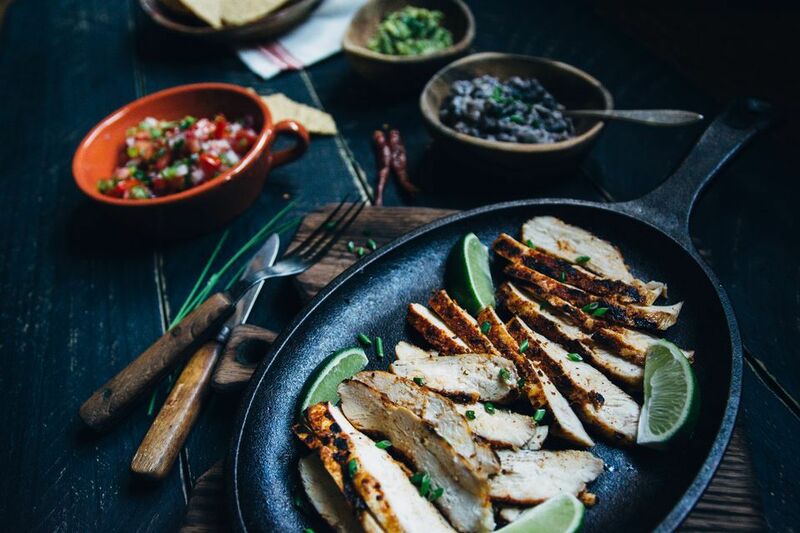 Remove chicken from grill to a clean plate, and serve warm with salsa or chimichurri sauce.